Considering that in Croatia there is no quality review of PSU, I started testing with the PSU that is available in our market, mostly cheap one. I still have a lot of things missing (equipment), there are plenty of room for improvement but it will be... In the last test I compared the LC Power vs EVGA. Critiques, recommendations and advice are welcome. Ripple & Noise (PARD) - If I'm not mistaken ripple is mainly tested the ms range. I do not understand why, since the frequency of switch is substantially higher, suits us range?! Last edited by ITelektro; 10-18-2015 at 06:59 PM. The 20 MHz bandwith is defined in the Intel psu design guidelines. Also the measurement procedure including the two small capacitors is described there. Yes, bendwith limit must be set to 20Mhz but it has nothing to do with ripple freq. SMPS generally work in the kHz range (About 100kHZ), which corresponds to us(microsec) range, not ms(milisec.) range. ms range is freq from main power. PARD will be the frequency of the SMPS circuit, not Hz(ms) range. If the ripple is measured at the output capacitor there is no need to add up capacitors. And it is best way to measure ripple. Last edited by ITelektro; 10-02-2015 at 04:53 AM. The voltage on the bulk capacitor has ripple at ~100Hz (2x the line freq). Since the DC/DC stage has a limited ripple suppression ratio at this frequency, part of that ripple may go through the entire DC/DC stage and remain in the DC output. Thanks for your reply. Your answer is correct, my question is perhaps a little imprecise. Do you think that the measurement ripple of SMPS in Hz range is more relevant than in kHz range? In the frequency range of the mains(50-60Hz) can not see a lot, it's boring line that goes down and up . But in the frequency range SMPS we can see a lot more. My question is, why Jonny selected first. One more thing, there is some PSU review that in CL test load at 3v&5v rails was 1A and some of them with 0A. Such a change in the test methodology will result in a a large difference in the results, especially when it comes to group-regulated power supply. That. While you may be focused on the details, you may lack the bigger image, here the low-frequency ripple. Which is often caused by switchers themselves, because the PFC usually mostly smooths rectified wall ripple (100/120 Hz). Usually. Also there may be a spike from time to time, if you choose too small window it will just fly by and you won't notice anything. Most today real O-scopes (not those pocket toys which may be handy for electricians, but not for PSU testing) can than zoom in and display details of an image you stopped at, but you won't zoom out if you work in us/ns range. As always, unlike in holywood movies (zooming 640Ã—480 image so you see what somebody eye reflects) - when the information is not there, you just won't get it (from pure air). Also there may be a spike from time to time, if you choose too small window it will just fly by and you won't notice anything. In other words, if I focus on the detail might miss an the detail? Is there one example of these periodic spikes? Please link. On the other hand, these periodic spikes are common in SMPS power supply and we call it noise. Measurements ripple in the ms(Hz) range fail to see that, as well as other information that we can see the ripple measurements in the frequency in which the SMPS actually works. Most today real O-scopes (not those pocket toys which may be handy for electricians, but not for PSU testing) can than zoom in and display details of an image you stopped at, but you won't zoom out if you work in us/ns range. As always, unlike in holywood movies (zooming 640Ã—480 image so you see what somebody eye reflects) - when the information is not there, you just won't get it (from pure air). This is where the problem is. Can you zoom in on the waveform at jonny review page and see a lot of information missing by measure ripple in the Hz range? Last edited by ITelektro; 10-25-2015 at 04:16 PM. You may not see that optically but the O-scope calculates it from the whole window. If you choose too small window it just won't. You think anybody calculates it manually? Where do you live? It's 2015, everybody uses peak-to-peak calculation function built in the O-scope. You think anybody calculates it manually? Where do you live? It's 2015, everybody uses peak-to-peak calculation function built in the O-scope. Its little bit funny, how did you calculate the frequency from this image? Manually! So where do you live? Have you even looked at the links? As you can see, my scope calculate ripple of switch power supply just fine. 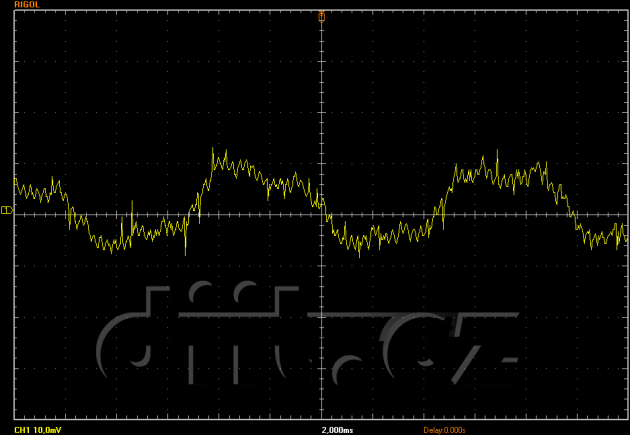 Freq PWM is 75kHz, ripple is 206.26mV and we can se noise of swich element when its turn on/off. This noise is at higher freq then ripple of SMPS. This information we cant get from measuring ripple of SMPS at ms range. Last edited by ITelektro; 10-26-2015 at 04:34 PM. need to test UPS, any safe electronic inside house for load test?